A lot of iPhone cases are kind boring but not this one. First of all this is an Hello Kitty iPhone case for the iPhone 4 and iPhone 4S. And the case is white with a build in stand that you can use to watch movies and stuff and this stand easily fold out from the back. Besides the stand this case has a picture of Hello Kitty on the back but not just any picture. The picture is actually a sliding puzzle so sometimes Hello Kitty will be not in the right order and that means that you have to stop playing Angry Birds and start solving the physical puzzle on the back. The concept of this iPhone case is rather unique and that is why you should have a closer look at this Hello Kitty Sliding Puzzle iPhone Case. How much would like to have this laptop sleeve? I am sure that many of you love this fun Hello Kitty case. This case is made for the 13″ Macbook and Macbook pro but of course will fit other 13″ laptops as well. The inside has a plush fur interior to make sure that you laptop will stay save. On the cover of the laptop case you see a nerdy version of Hello Kitty, a kitty that wears taped up glasses. And it says Hello Kitty i Love (made by an Apple) Nerds. And on the back you see an Apple with Hello Kitty written inside it. Now is the time to protect your laptops with a fun case. 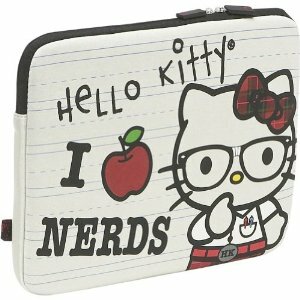 So don’t wait just come and get your Hello Kitty I Love Nerds Laptop Case. Apple products have those boring home buttons. Yes I know what I said and I said it because there is a solution for that. Now you can get a pack of 6 stickers that are made to fit perfectly on your home button of your iPhone, iPod Touch or iPad. A pack of 6 stickers will cost just under $2 and that includes shipping. You can get all kind of stickers from stars and strips to Angry Birds and Hello Kitty. Dress up your i device with these cool iPhone Home Button Stickers. Here we have our friendly kitten in a purple dress and a fresh flower in her hair. Hello Kitty fans will love this iPhone case for the Apple iPhone 4. The fresh colors and print make it feel festive almost like you are on a tropical vacation. Your iPhone 4 needs some protection and now you can get this hard cover for you iPhone that makes it a lot more protected from damage. The other fun part about this Hello Kitty iPhone case is that is cheap. You can get this case for less then 2 dollars and that includes world wide free shipping. WOW this means that your iPhone can look different every day. 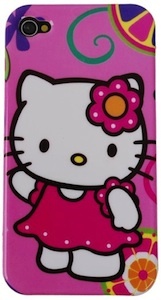 Have a peek at this Hello Kitty iPhone 4 Case. Want a nice little lamp for the dark nights working? 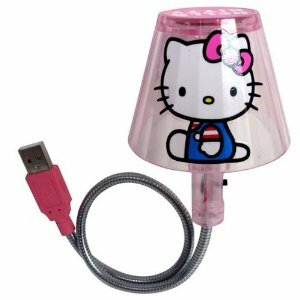 Just plug this Hello Kitty lamp in your USB port and you are ready to go. It will make your setup look nice and the build in 6 LED’s will give you plenty of light without the need of an extra power socket. Hello Kitty fans just have to check this lamp out so just go see the Hello Kitty USB Lamp. It is time to go back to school and that means that it is time to find all your things. But where did you keep your memory stick? A well stop looking and have a look at this 2GB Hello Kitty flash drive witch can be your new best friend this school year. 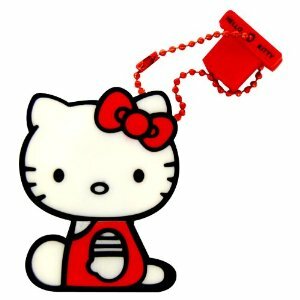 Order you Hello Kitty 2GB USB Flash Drive.